Researchers at the University of Twente and CNRS have recently carried out a study that explores the relationship between users' opinions and the personalized recommendations they receive online. In their paper, which was pre-published on arXiv, they proposed a model outlining this interaction, then evaluated it through extensive simulations and a mathematical analysis. "We all encounter recommender systems in our daily life, as soon as we reach out on the Internet, whether browsing Facebook or Twitter or shopping on Amazon," Paolo Frasca, one of the researchers who carried out the study, told TechXplore. "These systems are tasked to select the information that is most relevant to us." Essentially, recommender systems are designed to highlight particular online content that matches the preferences of individual users browsing the internet. In recent years, these systems have become increasingly popular, with many social media platforms and other websites using them to enhance user engagement, or to advertise products and services. 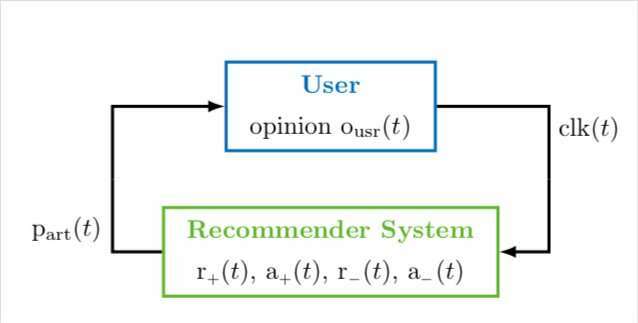 The research conducted by Frasca and his colleagues was aimed at achieving a better understanding of the interplay between users' opinions and the personalised recommendations put forward by recommender systems. As mathematicians, they developed a dynamic model of the interconnection between user and recommended content. "Our recommender system is very simple, since it only has two items from which to choose and it is characterised by a single parameter, which we call epsilon," Frasca explained. "The system keeps record of how much the items were appreciated (=clicked upon) in the past. 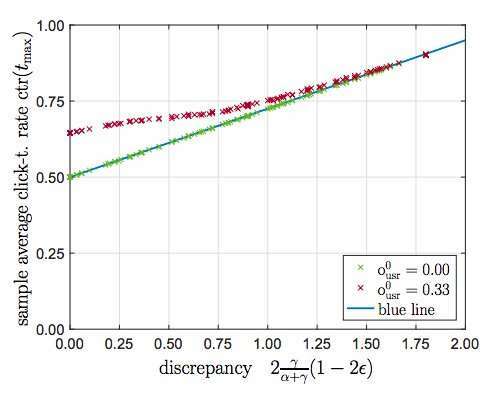 At each time it has to make a recommendation, the systems tosses a (biased) coin that returns head with probability epsilon (tail with probability 1-epsilon)." If the result of this coin tossing is head, the system recommends the most successful item recorded in its history; if it shows tail, it recommends an entirely random item. This process of randomisation allows the researchers to choose 'epsilon' to ensure that the system effectively balances diversity and accuracy in the recommendations it provides. Their model represents the interaction between a single user and an online news aggregator, in order to uncover the feedback loop between the evolution of this user's opinion and the personalised recommendations. It assumes that the user in question has a scalar opinion on a particular issue, characterized by a binary position, and that this opinion can be influenced by the news received online. Typically, the user is thought to have a confirmation bias, meaning that she will have a preference for content that confirms her opinion about a given issue. The researchers also assume that the recommender system's goal is that of maximising the number of user clicks, and to attain it, it has to compromise between exploring user preferences and exploiting them. Extensive numerical simulations and a mathematical analysis of the model found that personalised contents and confirmation bias both affected the evolution of a user's opinions, with the extent of this effect being related to the effectiveness of the recommender system. "We have highlighted that the behaviours of user and recommender system feed into each other in such a way that the behaviour of the user is altered," Frasca said. "At the same time, the parameter epsilon provides a knob to tune the amount of randomness and possibly mitigate the impact on the opinion of the user." The research carried out by Frasca and his colleagues provided interesting insight into the relationship between users' opinions and the personalised recommendations they receive online. However, this insight still needs to be validated further before it can be translated into policy recommendations. The researchers are now working on improving their model, to ensure that it better reflects real-life scenarios. "Our model is about one single user and two possible items," Frasca said. "Clearly, in reality, both users and items are numerous. We plan to extend the model to include a social network of users and a multiplicity of items. In a sense, our recent work has been a stepping stone to a more general model that is our next objective." Would it be simpler to model the audience. With a fuzzy Identification Matrix, you'd already know. Or place your audience, selection into your fuzzy universe based upon all input. Can't define a better control space that beats reality.